At Highlands, every Sunday is Thanksgiving dinner. And that means that every most weeks, we have turkey leftovers. Much to my delight, that means one thing. Turkey Tetrazini. We here in the Bachmann household devoured our turkey, but I’m seriously considering roasting another bird so that we can enjoy Lois Craig’s delicious recipe. Cook spaghetti in broth; drain. Mix the soup, mayonnaise, and milk until well blended. Add spaghetti, celery, mushrooms, pimento, chicken, and half of the cheese. Pour into casserole dish and sprinkle with the remaining cheese. Bake in a 350° oven for 45 minutes. While we are going to be celebrating our 110th camping season this summer, Highlands doesn’t shy away from modernization where it counts. We’ve been working hard over here at CH HQ to get our fabulous new online database system up and running. And it’s finally here! • Camp Highlands has moved to an online database management system that will help you easily enroll online, submit your paperwork, upload a recent photo of your son, see your payment history, set up scheduled payments, and MORE! It’s a more secure and faster way for you to get ready for summer! Yay! • If your son has attended CH before, we have you in the system! Do NOT create a new account. Use the email that we have on file for you. If you don’t know, email tracy@camphighlands.com and she’ll send it to you. 1. Go to the “enroll now” link. 2. 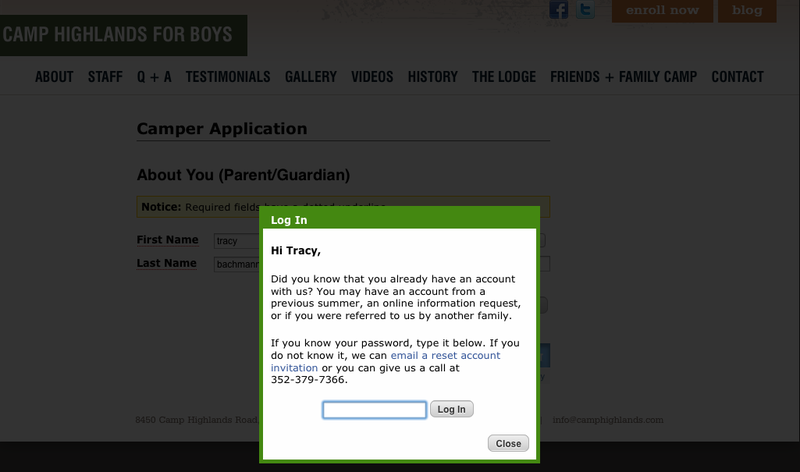 Enter your name, email and relationship to your camper and press continue. Please use the email you’d like us to use when communicating with you during the summer. You can change it at any time. 3. You’ll get a pop-up box saying you need to reset your password. Click the link (you can see it to the left in the blue underlined words). 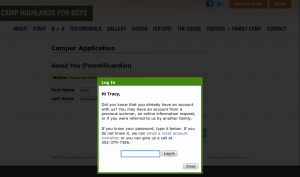 We will send you an email with a link you follow where you set the password up. Easy peasy! 4. All discounts are applied after you enroll. Including: paying in full in order to get the $100 off tuition and the Christmas t-shirt, brother discounts, scholarships, etc. If you have any questions about the system, please do not hesitate to call (352-379-7366) or email us!